I have some usb cams around the house and connected to old computers. I want to collect all the video and audio from these cams to a centralized NCS. I have installed NCS on each computer and added the usb cam, video and sound, and it works fine. On the main computer I have installed NCS. I have added each NCS (ncs1, ncs2 … ) from the peripheral computers using the template for Netcam Studio - Server - MJPEG - MP3 - Audio over HTTP enabled. Video works fine, but no audio from the usb cams. On the ncs1, ncs2, … default parameters are used. What is missing? 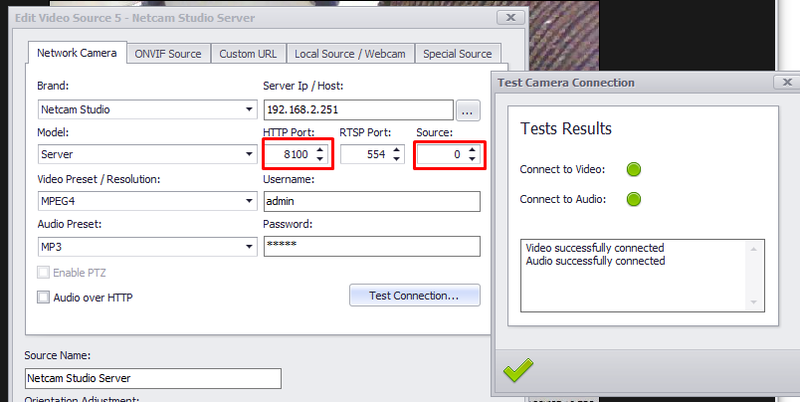 Netcam Stubio 1.7.0 server can read streaming of another NetcamStudio? 50% cpu for Intel i5-7400, CRF 30, Ultrafast, at 10FPS. What can I do about it? It works perfectly in VLC and Firefox, but with the same error. @Steve, realy need help to solve this. Last piece in the puzzle. Strange i’ve again tried and it works now. in MPEG4 preset both in custom url mode or with the unreleased template. Finally it works! One sort of important information was the NCS-source encoding to be H264_AAC ;). H264_MP3 works also, but with degraded audio quality. First it only worked with NCS X for the source and then it was NCS Target settings … Now I can reproduce it and it is stable for the source NCS X and service and NCS Target with the template. Very interesting! I suggest I write a guide for this. Here comes a short version. I was looking for a possibility to use an external USB microphone to get the sound into my central NCS system where I can do audio detection and where I have all my other cams. Also to correlate the video from the cam on the same location with the high end audio system. Problem is that usb cables are about 2-3 meter maximum and different types of usb extenders to not work with real-time systems like audio and video. I have an old laptop with win10 and NCS installed called NCS source. Start NCS X or NCS service. 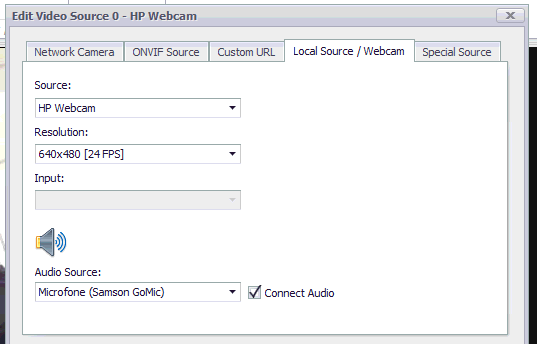 Add a source with Local Source / Webcam and use the built in webcam as the video source and as audio source enable the external usb microphone. On my computer, located in my server room, I have also NCS installed. Add a source with the template in the tab Network Camera. The source number must correspond to the same number as the webcam have on NCS - Source. Test connection and the important part is the green icon for the audio. An easy real-time check is to enable audio detection and have a look at the bar graph when talking into the mic.